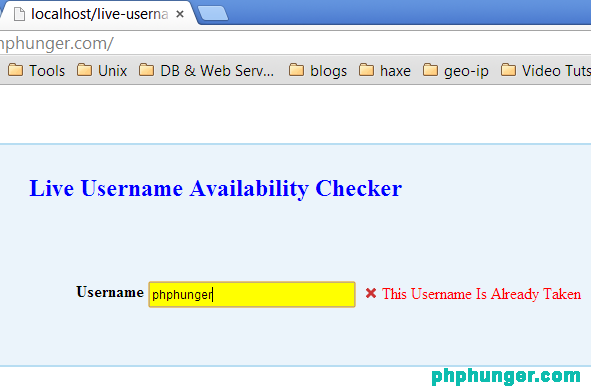 I guess you would have seen various websites which checks username availability on the fly during registration process. For example take “gmail signup” or "twitter signup" or "yahoo signup", their registration process is very flexible, it tells user everything on the fly. Means if i am typing a username it gives suggestions on the fly whether the username is available or not. 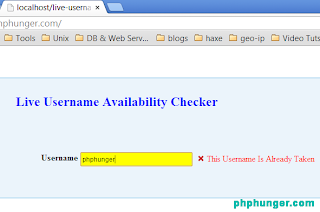 So in this tutorial i will make an ajax username availability checker powered with jQuery, PHP and MySQL. So let's get started. How the application will look like? Thanks for reading. Do regularly visit for more tutorials and subscribe for latest posts below. Please do find the below link for entire source code.